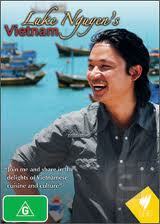 I’ve been watching epsiodes of Luke Nguyen’s Vietnam Tour back to back on DVD and dreaming of a long holiday there. The beaches look amazing, as do the cool mountainous territories filled with flowers and colonial architecture. But I’m also hankering after less obvious tourist attractions – the noisy markets with produce I’ve never before laid eyes on, the food halls where neon plastic tables and chairs reign and the food is super-quick, delicious and cheap, the narrow alleys where dogs lounge and locals squat on their doorstep and casually slurp noodles. This guy must be the most laid-back, unpretentious presenter on the food tour scene. Next time I’m in Sydney I’ll make sure I book at his Surry Hills restuarnt, Red Lantern.